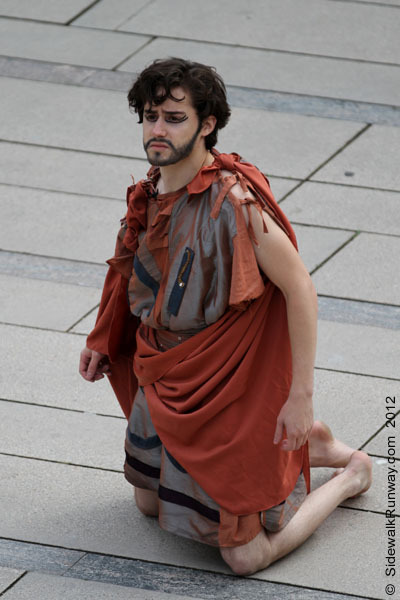 Ancient Greek Tragedy Gallery — If the sidewalk was a runway, what would you wear? Greece is prominently featured in the news each night. While I won’t delve into politics or the European Union debt crisis, I did remember photographing a Greek play in September. I never posted the photos but now is the perfect time. I took a leisurely stroll after work. I passed Robson Square not realizing “Iphigenia in Tauris” was in progress. A number of people were sitting on the steps watching the outdoor performance. The ancient dialogue was challenging to understand but I was struck by the long flowing robes. Compared to today’s mass produced modern clothing it was interesting to imagine the craftsmanship required to make garments in 484 BC.